A Sudanese teacher arrested after protests died due to injuries caused by a “solid object”, according to a medical report cited by the head of a state investigations committee. The announcement came as hundreds gathered across the capital – responding to a call by activists for a “procession for victims of torture and arrests” – in some of the biggest anti-government rallies in weeks. The teacher died on Friday after protests in Khashm al-Qirbam, his family said – one of dozens of demonstrations against economic hardships and President Omar al-Bashir’s rule that rocked Sudan since December 19. “The cause of death is from various injuries from a solid, flexible object, to his back, kidneys and thighs and between his legs,” the head of an investigation committee for the public prosecutor, Amer Mohamed Ibrahim, told reporters. A regional police chief initially said the teacher died of food poisoning. The medical report showed no toxins found in the teacher’s body, Ibrahim said. At least 45 people have been killed in protests, rights groups say. Government puts the death toll at 30, including two security force members. Authorities blame the unrest on “infiltrators” and foreign agents. “Parties hostile to Sudan” financed a media campaign accompanying the protests, the presidency said in a statement. In al-Daim neighbourhood in central Khartoum on Thursday, hundreds of demonstrators blocked roads with burning tyres and tree branches, witnesses said. Clashes erupted when security forces fired tear gas at demonstrators, some of who threw stones at police, according to witnesses. There were no immediate reports of casualties, but security forces were seen arresting protesters and putting them into pick-up trucks. Security forces used teargas against a separate, peaceful hundreds-strong march in the downtown area about 1km from the presidential palace, witnesses said. “Peaceful, peaceful against the thieves,” and “Down, that’s it,” they chanted – anti-government slogans repeated throughout the protests. 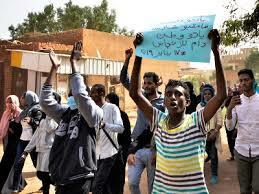 Protests were reported in two other districts of Khartoum, including the flashpoint neighbourhood Burri. “We are determined to continue protests till the end,” a 38-year-old demonstrator who declined to be named told Reuters in central Khartoum. “We are certain the regime will fall,” he added.